Figure 4 Sequential images obtained from a representative field of superficial peritubular capillaries before renal artery occlusion and after release of the clamp. Note the initially interrupted blood flow abated after the renal artery was clamped and 1 to 2 minutes after release of the clamp (frame 46'). Of note, not all capillaries seen at the initial image remain perfused on the subsequent postischemia images. Figure 5 Time course of changes in red blood cell (RBC) velocity in postischemic peritubular capillaries. Shaded area, means SE. Individual experimental sequences are represented by different symbols. Inset: Proportion of nonfunctional peritubular capillaries in the postischemic kidney. vasoconstrictors, compared to the control groups. 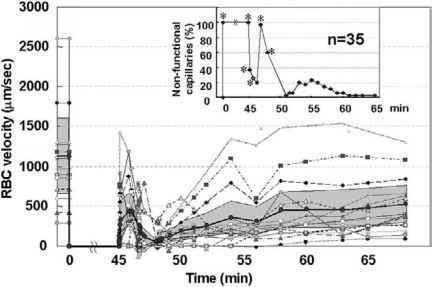 Similarly, the vessels from transplanted kidneys were less responsive to the vasodilators than was the control tissue. There were no vessel reactivity differences in nonrenal arteries. This study demonstrates that small-artery reactivity is reduced in transplanted kidneys, regardless of their source. Further, the small arteries in all the transplanted kidneys appeared more constricted, which may contribute to reduced function and survival in transplanted kidneys. A recent clinical study used a similar hypothesis to identify the predictive value of vascular resistance on allograft survival. In a prospective study of 601 transplanted patients, renal segmental arterial index (RI) was measured at least 3 months after surgery in order to exclude acute rejection causes . RI was determined by the percent reduction of the end-diastolic flow compared with the systolic flow in renal segmental arteries, measured by Doppler ultra-sonography. This value reflects primarily renal cortical vascular resistance. They divided the subjects into RI of greater than 80 (122 patients) and less than 80 (479 patients) and tested the hypothesis that lower renal resistances (an RI of less than 80) predicted long-term allograft survival. The combined end point that defined survival was a reduction in creatinine clearance of 50 percent. Patients were followed for up to 3 years. Sixty-nine percent of the high-RI patients showed a 50 percent reduction in creatinine clearance compared to only 12 percent of the low-RI patients. In addition, 47 percent of the high-RI patients and only 9 percent of the low-RI patients required dialysis. Though this study did not evaluate nonresistance issues in rejection, it confirmed that high vascular resistance predicted poor allograft performance.